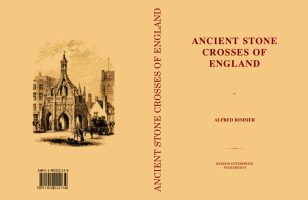 Description: This book contains descriptions of Stone Crosses across the British Isles. Including, the market crosses at Chichester, Salisbury and Ross; Winchester “Butter Cross” ; crosses at Glastonbury, Iona, Abingdon, Leighton-Buzzard, Waltham, Bromboro, etc. Base of a Cross in Bebbington Churchyard, Cheshire; Base of High-Cross at Alyburton; Bases in Gloucestershire and Norfolk; Bitterley Cross, Salop; Black Friars' Preaching-Cross, Hereford; Bromboro Cross; Charing Cross (From The Crowle Collection); Cheddar Cross; Chichester Market Cross; Cirencester Cross; Conduit Near St. Mary's, Lincoln; Cornish Cross at Fourhole; Cross at Abingdon; Cross at Ampney-Crucis; Cross at Clearwell, Gloucestershire; Cross at Dindar; Cross at Forraberry; Cross at Headington, Oxford; Cross at Iona; Cross at Langley; Cross at Shepton-Mallet; Cross at Stalbridge, Dorset; Cross in Bakewell Churchyard; Cross in Bisley Churchyard; Cross in Nevern Churchyard; Cross in St. Mary's Churchyard, Cricklade; Cross in St. Sampson's Churchyard Cricklade; Crosses at Sandbach, Cheshire; Devizes Cross; Elegant Roadside Cross at Hereford; Eyam Cross, Derbyshire; Geddington Cross; Glastonbury New Cross; Glastonbury Old Cross; Glendower's Cross, in Merioneth; Gloucester Cross; Head of a Cross, Delamere, Cheshire; Head of Henley Cross; Hempsted Cross, Gloucester; Holbeach Cross, Lincoln; Incised Slabs, Chester Cathedral; Interior View of Malmesbury Market Cross; Leighton-Buzzard Cross, Bedfordshire; Lydney Cross, Gloucester; Market-Cross at Oakham; Monasterboice Cross, Louth; Newark Cross; North Petherton Cross; Northampton Cross; Our Lady's Well, Hempsted; Plan of Cheddar Cross; Plan of Chichester Market Cross; Plan of Dundry Cross; Plan of Geddington Cross; Plan of Northampton Cross; Remains of Preaching-Cross at Iron-Acton; Remains of Runic Cross, Cheshire; Restoration of Chester High-Cross; Ross Market-House; Salisbury Market-Cross; Singular Market-Cross at Ipswich; Somersby Cross; South and West Sides of Sandbach Cross; St. Columb Cross, Cornwall; St. Mawgan's Cross, Cornwall; The Market-Cross of Malmesbury; The Market-Place, Shrewsbury; The Old Cross, Bristol; Tottenham Cross; Waltham Cross; Wheston Cross, Derby; Winchester "Butter" Cross.